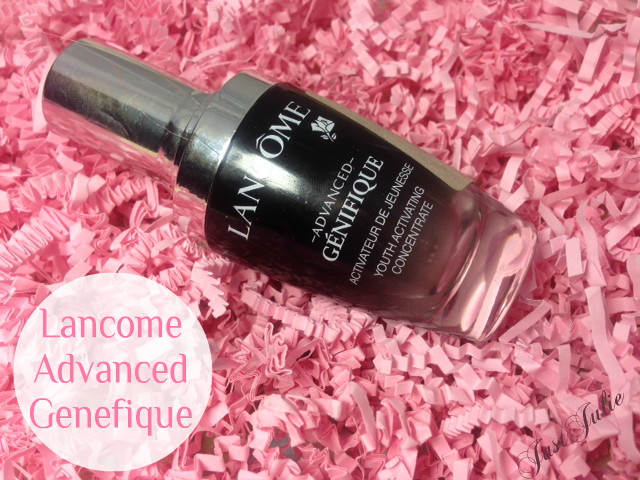 Lancôme Advanced Génefique | The Review! I've been using Lancômes Advanced Génefique Serum for just over two months now, so thought it would be the ideal time to give you all a review on the award winning anti-ageing serum. I bought Lancômes Advanced Génifique Youth Activating Skincare Collection two months ago, you can view the original post just HERE. The main reason for buying the skincare collection was to try out the Advanced Génefique Serum, which has won awards left right and centre for being the best anti-ageing serum on the market. I'm 32 and have been concerned about the whole ageing process for way too many years! Previously I had been using No7 Protect and Perfect Serum for around 8-7 years, and although I wasn't unhappy with it, I just felt now that I'm in my thirties my skin could do with trying something different as my skincare regime hadn't changed in years. My skin as a whole is quite young for it's age but I hate the uneven redness that I have on my cheeks and of course hate those forehead lines so I would say I'm looking for a miracle in a bottle! The Advanced Génefique claims to help restore youthfulness by improving the appearance of 10 clinical signs that define a youthful-looking skin. Lancômes laboratories have discovered that everyone's skin releases a protein which helps restore our youthful looking skin but as we get older our skin releases the protein at a much slower rate, so what the Advanced Génefique does is help our skin release this protein at the rate it once did back in our early twenties and as result the benefits that you should get from using this is, Smooths Fine Lines and Deep Wrinkles, Boosts Radiance, Clarifies and Evens Skin Tone, Improves Skin Texture, Increases Elasticity and Tonicity, Firms and hydrates the skin. 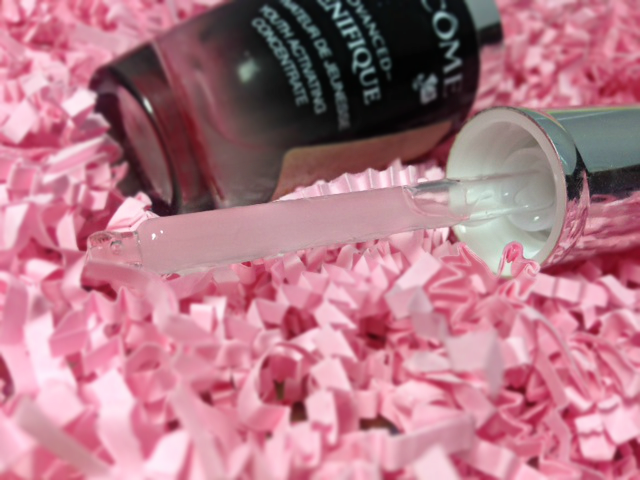 You apply the serum after cleansed skin and before moisturising. I only use this in the morning as I've been using Lancôme Visionnaire Advanced Skin Corrector for the evenings, but you can use this both day and night if you want to. To disperse the serum there is a pipette attached to the lid, which I really like. I've seen written around that you need 3 pumps of serum to do a whole face. This couldn't be any further from the truth. You need one and that is all. The packaging actually allows you to get the right amount each time. When you turn and close the lid you hear and feel a click, once that's done the pipette automatically fills itself up, around 3 quarters of the way and this is how much you need for your face. The serum is very lightweight and absorbs into the skin pretty much straight away so it's safe to pop your moisturiser over the top straight away. One down side is the fragrance. I have been using fragrance free skincare for so many years that at first the scent put me me off as I wasn't used to this, but two months down the line I can't remember when I actually last noticed the scent, so it's no longer an issue for me. I honestly love this serum. I noticed a massive change to my skin almost straight away. The uneven redness on my cheeks has improved, although it's not gone, but that would be expecting too much. My skin looks and feels less dull and more radiant. The texture of my skin has changed dramatically, it feels super soft now and my skin is feeling less dehydrated also. The lines on my forehead are still there, I know they aren't going no where but they do appear to be slightly softer looking. Now I have also changed up my whole skincare routine and been trialling out other skincare products (aside from the serum, I use it daily) so of course the change could also come down to the other products I've been using BUT this is the only product I've used for two months straight (along with Lancôme Visionnaire Advanced Skin Corrector in the evening which I adore too) so I honestly do think the main reason for the improvement of my skin is down to this little bottle of awesomeness! Would I repurchase it? Yes I would BUT not before trialling out another serum that I have sitting in my cupboard by L'Oreal (who make and own Lancôme) which costs a damn sight less than the Advanced Génefique, which costs £59 for 30ml, which is a lot of money, money I don't mind spending on a product that works, which this does. But the sensible girl inside me, which rarely pops up her ugly head, tells me to shop around to see if something cheaper will give me the same results before splurging on this again. I will say though that I still have around a third of the bottle left so I'm guessing this will last me around three months, so £59 every three months isn't too bad on a product that does work BUT I'd rather spend £20 on a product every three months that does the same thing.... so it will be interesting to see if the L'Oreal serum is as good as this, and of course I will write a post about the L'Oreal Serum after I've been using it for a few months too. Do you use any anti-ageing serums/creams? What anti-ageing products do you swear by?